Pascal Piazzola is well known for his fine craftsmanship of pipes. These pipes come from the now retired pipe maker's collection originally crafted in the 1960's and 1970's. Monsieur Piazolla helped establish Jean Lacroix's well known briar pipe line, eventually leaving to build his own brand and further establish his own artistic style. 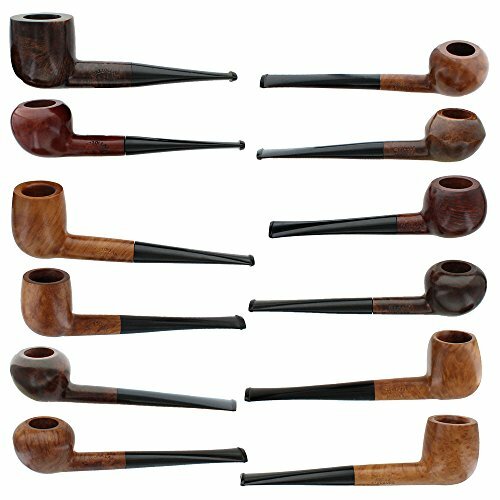 Sample image depicts a typical variety of pipes you can expect to receive with your purchase. Pipe shapes, colors, sizes, etc will vary. 12 pipes included with your purchase. These pipes are non-filtered. If you have any questions about this product by Pascal Piazzolla, contact us by completing and submitting the form below. If you are looking for a specif part number, please include it with your message.